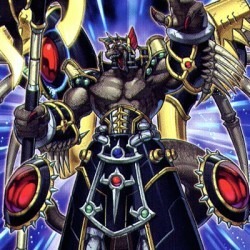 When this card is Special Summoned by the effect of a "Gladiator Beast" monster, destroy 1 face-down Spell or Trap Card. At the end of your Battle Phase, if this card attacked or was attacked, return .. If your opponent controls a monster, you can Normal Summon this card with 1 Tribute. During battle between this attacking card and a Defense Position monster whose DEF is lower than the ATK of this ca..
During your Main Phase 1, you can remove this card from play and select 1 face-up Fiend-Type monster you control. That monster can attack twice during each Battle Phase. Special Summon this card in fa.. This card cannot be destroyed by battle. If this card is in face-up Defense Position, destroy it. When this card declares an attack, change the battle positions of all face-up monsters except "Cloudai.. This card cannot be Special Summoned. All Battle Damage to either player from a battle involving this monster becomes 0. If this card is destroyed by battle, distribute new Fog Counters equal to the L.. This card cannot be destroyed by battle. If this card is in face-up Defense Position, destroy it. You can Tribute any number of WATER monsters for the Tribute Summon of this card. When this card is Tr.. When this card is destroyed by battle and sent to the Graveyard, Special Summon 2 "Cloudian Tokens" (Fairy-Type/WATER/Level 1/ATK 0/DEF 0) in Defense Position. These tokens cannot be Tributed for a Tr.. This card cannot be destroyed by battle. If this card is in face-up Defense Position, destroy it. When you Normal Summon this card, place 1 Fog Counter on it for each "Cloudian" monster on the field. ..